Hope you are Enjoying WordPress Theme! We have launched new Theme ” Scoreline Premium WordPress Theme”. Scoreline is a responsive and fully customizable template for Business and Multi-purpose theme. You can use it for your business, portfolio, blogging or any type of site. Custom menus to choose the menu in Primary Location that is in Header area of the site which is ideal for creating a corporate / business website. 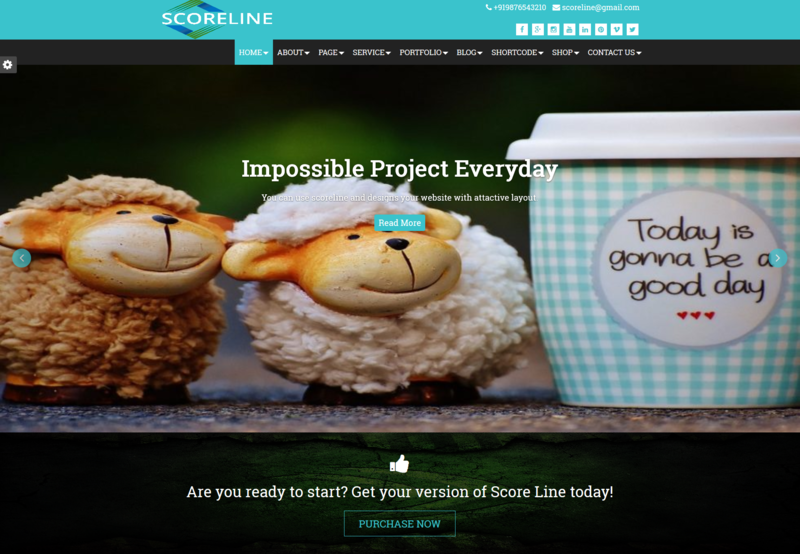 Scoreline WordPress Theme is Responsive and flexible based on BOOTSTRAP CSS framework that adapts your website to mobile devices and the desktop or any other viewing environment. We focused on flexibility across various devices, starting with smartphones. Scoreline is a Cross-Browser Compatible theme that works on All leading web browsers. Scoreline focusing on business template, awesome Swiper slider and Flex slider, Powerful but simple. Theme Options for full CMS control option to match your logo & website, wide layout, light & dark color skin, and many more. Scoreline focused on flexibility across various devices, starting with smartphones. Scoreline is a Cross-Browser Compatible theme that works on All leading web browsers. Higher Resolution page design compatible with all portable devices like iPhone, iPad. Different types of Hover Effects that make Theme Different. Custom menus to choose the menu in Primary Location that is in Header area of the site. In header area and footer of the theme offers Social Media Links to add your Social Links in Theme. Scoreline focusing on a light & dark color skin and Theme Backgrounds. 8. Scoreline is Woo-commerce Compatible theme. In Scoreline Premium Theme we used Swiper Slider, which is a fully responsive touch slider and compatible with any devices mobile, tablet etc. This is main Features of This theme. In Scoreline we use another slider i.e. Flex Slider, which is a fully responsive touch slider and compatible with any devices mobile, tablet etc. Two Column, Three Column, Four Column Layout used for Portfolio and Blog with Category. Theme has many Templates for Service, Portfolio, Blog, About Us, Contact Us and Page. In Testimonial, Fun facts, Team and Callout section we can add a background image. Style Switcher gives different color for the theme. In theme general setting have different types of option which we can use. You can change Service URL , Portfolio URL , Testimonial URL, Team URL and Client URL from here. You can manage Home Page from here. Facts title and Facts description can be changed from here. You can Add many Fun-facts here. You can change contact setting. You can change Theme color, Theme Layout, Custom background and custom background image. 15.1 You can add Social Icons and their Links here. In Scoreline Theme Service Setting contain Extra Section. In Extra Section you can add content, media and shortcode. In Blog Setting you can select Blog Template and Blog Slideshow Items. In Portfolio Setting you can select Portfolio Template and Category to show on Home Page. In this section 2 type of Team Template that can make Theme different. In Testimonial you can select Testimonial Template and add Background for Testimonial Section. In Client Section you can set AutoPlay or Time Interval for Client Slider. In this you can select Callout Template and manage Callout Background Image. Thanks For Reading this Tutorial and visiting our site.